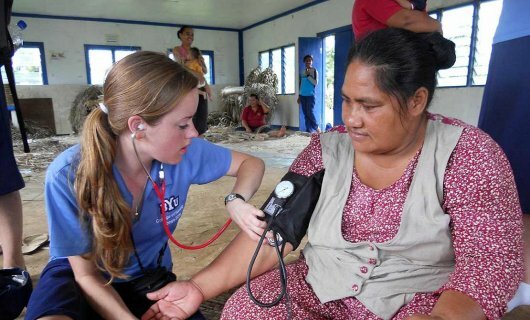 Three crucial issues essential to improving the health of people in the Pacific Islands will be the focus of a seminar organised by Massey University and hosted by the Dutch Embassy later this month. While November 11, Armistice Day, is traditionally a date to remember the fallen soldiers of World War I, organisers of the Pacific Health Seminar to be held on the same date, want seminar participants to also remember the need to acknowledge the challenges faced by Pasifika nations in achieving and maintaining good health. Centre for Public Health Research director Professor Jeroen Douwes says on all three issues to be addressed by the seminar - cancer rates, pesticide use and training and education, Pasifika nations are lacking on information and the ability to offset their worst effects. Dutch Ambassador Rob Zaagman says his Embassy also has a special interest in the issues as it is officially accredited to Fiji, Samoa, Kiribati, Tuvalu and Tonga. College of Health Pro Vice Chancellor Professor Paul McDonald will introduce speakers at the event including Professor Don Matheson, Centre for Public Health research officers Dr Tupa'ilevaililigi Ridvan Firestone and Dr Sunia Foliaki, Fonterra senior research scientist Dr Palatasa Havea and Ministry of Agriculture, Food and Fisheries deputy director Dr Sione Foliaki. Professor Douwes hopes that the event may lead to a wider call to action from the international community to get involved in helping address certain health issues in the region that has not had the priority others have. A World Health Organisation non-communicable diseases action plan for 2013 -2020 proposes a series of targets including the reduction of 25 per cent of mortality from four conditions including cardiovascular disease, diabetes, chronic respiratory illnesses and cancer. Dr Foliaki says the focus on cancer is particularly pertinent to Pasifika nations that lack both data and effective screening processes for prevention and control of the deadly disease. It has become the second leading cause of death in the majority of Pacific Island countries. Similarly, pesticide use is another issue that requires urgent attention. Dr Foliaki says up to 80 per cent of deaths caused by pesticides happen in developing countries where many locals are not fully aware of what they’re being exposed to or the potential health impacts. Studies undertaken in other countries such as Mexico showed severely reduced neuropsychological development among children exposed unnecessarily to such chemicals, though it was still unknown how big an issue it is in the Pacific Islands. Measures such as applying labels to pesticide containers in the relevant local languages as well as community education could help reduce the incidence of poisoning and other exposures to them; as could through appropriate research the use, presence and health impacts of pesticides in Pacific islands environments and communities. Both he and Professor Douwes agreed that while the solutions were challenging, addressing environmental health issues, that also include respiratory illnesses like asthma, was less imposing than others affecting the region such as climate change which require solutions taken in other countries. Many of the solutions lay with training and education, ranging from providing the funds for medical equipment such as lung functioning machines to managing and diagnosing respiratory disease. Dr Foliaki has previously been involved with setting up cancer registers and asthma clinics in the Pacific but he and Professor Douwes stress there is a need to train locals more and encourage the emergence of international mentors for a new generation of health professionals. “We need cooperation from international countries. If they can find funding for such issues then such a development becomes permanent and it’s possible to make change,” Professor Douwes says.